But first, a few words about ADDIE. Next to religion, politics, and whether you’re a PC or a MAC user, ADDIE, with its sequential steps of analysis, design, development, implementation, and evaluation, tends to arouse a lot of fervor in instructional designers. ADDIE’s an important model and for a discussion of its history and morphing, see the always excellent site, Big Dog Little Dog’s Performance Juxtaposition. However, time constraints, client logistics, and the natures of dynamic organizations often make ADDIE (at least in its older incarnations) untenable. For many instructional designers, ADDIE’s become synonymous with a bygone era with a much slower pace , though arguably ADDIE was never intended to be so rigidly applied. Agile design is an alternative approach that has a lot of merit. 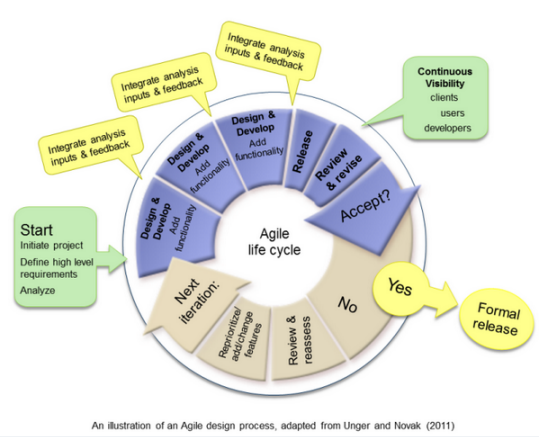 Agile has its origins in the software development industry, famous for its rapid cycle times. Agile embraces the idea that development occurs in steps and iteratively, as analysis inputs are collected from busy cross-functional teams. It’s about flexible responses to a changing picture of what the situation on the ground is really like. The important difference between Agile and ADDIE is that in Agile design, recommendations, preliminary mockups, and pieces of a project are shared with clients and target audiences early to see if they’ll fly. Adjustments are made throughout the design and development process rather than after development and/or implementation. Although ADDIE is an important foundational model, I think that Agile design reduces the risk of spending a lot of time creating a very polished product that ultimately isn’t very useful. Agile turns clients and potential learners into active participants throughout the design process, which makes it more likely that your solution will actually be integrated into an organization’s workflow.